Every emblem of the Olympics tells a story. The Beijing 2008 Olympic Games emblem "Chinese Seal, Dancing Beijing" is filled with <?xml:namespace prefix = st1 ns = "urn:schemas-microsoft-com:office:smarttags" />Beijing's hospitality and hopes, and carries the city's commitment to the world. "Dancing Beijing" is a milestone of the Olympics. It serves as a classic chapter of the Olympic epic inscribed by the spirit of the Chinese nation, calligraphed by the deeper import of the ancient civilization, and molded by the character of Cathay's descendents. It is concise yet deep inside, bringing forth the city's gradual changes and development. It appears dignified yet bears a tune of romance, reflecting the nation's thoughts and emotions. In the lead up to the Beijing 2008 Olympics, the emblem will attract more and more people from around the world to Beijing and China to join the great celebration with the Chinese people. "Dancing Beijing" is a Chinese Seal. It is engraved with commitment made to the Olympic Movement by a country that has 56 ethnic groups and a population of 1.3 billion. While witnessing the advocacy of the Olympic Spirit by a nation with both ancient civilization and modern culture, it also unfolds a future-oriented city's pursuit of the Olympic Ideal. It is a symbol of trust and an expression of self confidence, standing for the solemn yet sacred promise that Beijing -- the host city of the Beijing 2008 Olympic Games -- has made to the world and to all mankind. "Complete sincerity can affect even metal and stone (literally meaning sincerity smoothes the way to success)." The inception of our ancestors' wisdom and the image of a seal made of metal and stone allow the emblem to present Chinese people's respect and honesty for the Olympics. The moment we earnestly imprint the emblem with the "Chinese seal", Beijing is about to show the world a grand picture of "peace, friendship, and progress of mankind" and to strike up the passionate movement of "faster, higher, and stronger" for mankind. "Dancing Beijing" serves as the city's foremost appearance. It is an image that shows the eastern ways of thinking and the nation's lasting appeal embodied in the Chinese characters. It is an expression that conveys the unique cultural quality and elegance of Chinese civilization. With inspiration from the traditional Chinese art form -- calligraphic art, the character "Jing" (the latter of the city's name) is developed into the form of a dancing human being, reflecting the ideal of a "New Olympics". 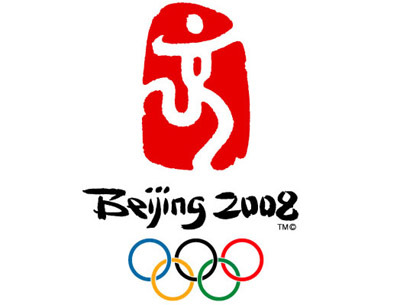 The words "Beijing 2008" also resembles the vivid shapes of Chinese characters in handwriting, voicing in concise strokes of the countless feelings Chinese people possess towards the Olympics. As people ponder on the rich connotations and charms of these Chinese characters, a "New Beijing" has thus been brought forward. "Dancing Beijing" is a favorite color of the Chinese people. The colour "red" is intensively used in the emblem, hushing the passion up to a new level. It carries Chinese people's longing for luck and happiness and their explanation of life. Red is the color of the Sun and the Holy Fire, representing life and a new beginning. Red is mind at ease, symbol of vitality, and China's blessing and invitation to the world. "Dancing Beijing" calls upon heroes. Olympic Games functions as the stage where heroes are made known, miracles created and glories earned, and where every participant constitutes an indispensable part of the occasion. The powerful and dynamic design of the emblem is a life poem written by all participants with their passion, affections, and enthusiasm. It is an oath every participant takes to contribute power and wisdom to the Olympics. The emblem cheers for arts and for the Olympic heroes, who pass down the essence of the Olympic Spirit, which well connects sports and cultures. "Dancing Beijing" extends the totem of the Chinese nation. The form of a running human being stands for the beauty and magnificence of life. Its graceful curves are like the body of a wriggling dragon, relating the past and future of one same civilization; they are like rivers, carrying the century-old history and the nation's pride; they are like veins, pulsing with vitality of life. The intrinsic values of sports -- athlete-centered and people-oriented -- are well defined and upgraded in an artistic way in "the dance of Beijing." We sing if words fail to explain it all, and we dance if the singing does not explicitly tell the meaning. Vigorous Beijing is looking forward to the celebration in 2008 and the Olympics wait all mankind to dance together. "Dancing Beijing" is a kind invitation. The open arms in the emblem say that China is opening its arms to welcome the rest of the world to join the Olympics, a celebration of "peace, friendship and progress of mankind." "Is it not a joy to have friends come from afar?" The idiom portraits the feelings of friendly and hospitable Chinese people and expresses the sincerity of the city. Come, and let us together weave a peaceful and wonderful dream.